This ain’t your grandmother’s art in the park. It’s hip, bold and expressive – an explosion of color and creativity. Experience paint, chalk, graffiti, horns, drums and all forms of music & dance from the east side to the west. Jump in and be a part of it. At this art jam, you’re not just seeing it, you’re living it. Your 10 dollar ticket will help local organizations fight the heroin/ opioid crisis in our community. Thanks to our Presenting Sponsor, Hannaford Supermarkets, who is participating for the second year. Listen below to our interview with Hannaford Supermarkets. Artist registration is now closed. We look forward to the following featured artists! Get your creative juices flowing and your paintbrush going for WZID’s Art Jam Photo Contest and you could be selected to win a $200 gift card! The rules are simple. Post a picture of YOUR original artistic expression below with the hashtag #Artjamriverside. The best part is, your photo can be of anything! Share some of your art and photography, or maybe have a friend snap a picture of you expressing your inner creative, whether that be of you singing, dancing, painting etc. The winner of the competition will win a $200 Visa Gift Card and all submissions will be displayed at Art Jam Riverside’s photo wall on Saturday, September 8th in Arms Park. Submissions are welcome from August 20th until September 8th, so make sure you have your camera or phone at the ready for when inspiration strikes. 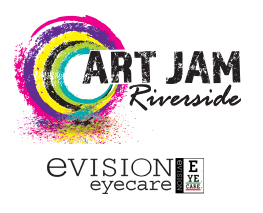 Sponsored by Evision Eye Care, helping you view the arts through a clear lens. Families in Transition-New Horizons is one of the largest homeless services organizations in New Hampshire with locations in Manchester, Concord, Dover and Wolfeboro. The organization provides hunger relief, emergency shelter, safe affordable housing, and supportive services to individuals and families who are homeless or in need, enabling them to gain self-sufficiency and respect. One of its larger programs is its Willows Substance Use Treatment Center and Recovery Housing for women and men. The program specializes in providing evidence based practices to address substance use disorders as well as mental health and trauma. For more information about the organization and its programs visit www.fitnh.org. Listen to our interview with Families in Transition-New Horizons below! Recovery Community Centers are a place for people who are interested in recovery. We offer a safe judgement free space and peer support to those who are seeking recovery, family and friends of, or those who are in recovery themselves that know the importance of giving back what was freely given to them. Our main focus is to help people learn to get comfortable in their recovery utilizing a non-clinical peer to peer based approach. Helping people learn how to have fun in their recovery so that they wish to remain in recovery is our top priority. We do also offer telephone recovery support, social events, meetings and several groups throughout the week: AA, NA, HA, SMART, Art, Music, and so much more. Listen to our interview with HOPE for NH Recovery below! Pinard Waste Systems Co., Inc.